Hi everyone! Thanks so much for visiting Church & Sons Painting Co. My name is Jeff Church. I'm a native San Franciscan raised in The City by my Gramma. I grew up in huge beautiful Edwardian and Victorian style homes. It was growing up in those wonderfully detailed homes where I learned to paint the intricate woodwork and walls with the love, patience and detail they so richly deserved. To Church & Sons Painting four walls are a canvas waiting to be made over and transformed by our customer’s vision and imagination. It truly inspires us to completely change the atmosphere of a room by adding just the right color, careful detail, and love to every inch of that space. That’s what we do best! Give us a call at 925-813-0006. 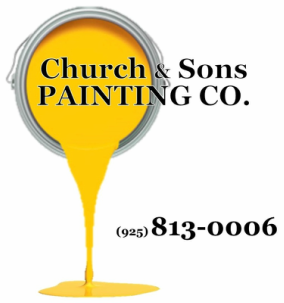 Let Church & Sons Painting Co. bring a beautifully detailed masterpiece of a paint job into your home!